I learned from a friend of his family that "Ralf" Szyglowski would be celebrating his 90th birthday in April 2011. Szyglowski (who later changed his name to Siegler) had been the Bordfunker of 3./NSG 9's Kapitän, Hptm. Eduard Reither and had risen to the rank of Feldwebel. Among Herr Siegler's birthday gifts were a copy of Ghost Bombers and a model of E8+AL, the Ju 87 in which he flew with Ltn. 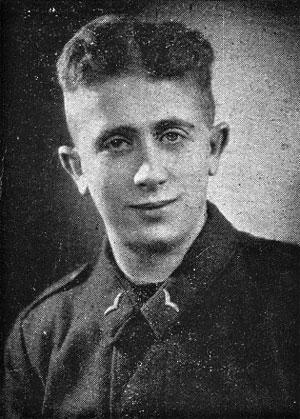 Peter Stollwerck in January 1945. Willi Happe was just 20 when he died when his own aircraft collided with another Ju 87. He was mourned by his parents, four brothers, two sisters and a brother-in-law. This photograph comes from a memorial card bought at auction by Christian Berring of Denmark. The card records that Happe had served for two years before he died in collision with a friendly aircraft while landing in the vicinity of Florence and that he was buried in the military cemetery of Florence-Trespiano. It goes on to express the family's belief that although he had not come home, they would all be reunited in the next world. Note: Thanks to Christian Berring for kindly supplying a scan of his document. On 8 November a Maj. Kessler (on the staff of Komm. Gen. Italien), signalled General der Schlachtflieger at Berlin-Rangsdorf, requesting authority from the Personnel Branch for the recall and transfer of NSG 9’s Ltn. Friedrich Istein [sic] as he was unfitted for night flying.